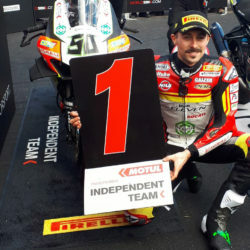 In a dramatic and closely-fought Race 2 at Brno Milwaukee Aprilia riders Eugene Laverty and Lorenzo Savadori delivered the team’s best WorldSBK result with P4 and P5. Following a similarly hard-fought contest in Race 1 where they finished P6 and P7 respectively, Eugene and Lorenzo lined up P3 and P4 for Sunday’s race. Eugene got away strong from the front row and took the fight to Lowes and Van der Mark, while Lorenzo initially struggled and slipped to P8. Eugene ran slightly wide and was passed for third by Melandri on lap 2, while a crash for Rea in P7 moved Lorenzo up a place. Eugene fought with Davies for P4 but lost out, before Melandri ran wide and dropped out of contention. 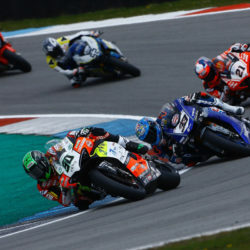 From there the teammates were locked in a tense fight with Rinaldi in fifth, Eugene’s consistent pace keeping him at bay while Lorenzo was in attack mode and looking very comfortable on the Aprilia. Lapping mere tenths apart Eugene pulled out a small gap and Lorenzo made a strong move on Rinaldi on lap 14 to take P5. 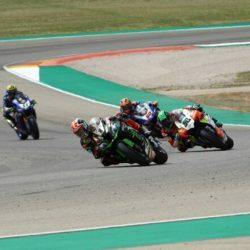 They ran nose to tail for the final laps and crossed the line just 0.294 apart, scoring an excellent best-ever result for the team in WorldSBK and demonstrating the big progress made over the last two rounds. The championship now heads overseas for Round 8 to Laguna Seca in California, USA, a track that should play to the Aprilia’s strengths and brought the team solid top 8 finishes in 2017. Round 8 of the WorldSBK championship takes place at the Laguna Seca circuit in the United States, 22-24 June.